FOI request reveals ICO has served no “notices of intent” to serve fines under GDPR. A new piece by me on the Mishcon de Reya website. It’s not unusual for the recipient of a monetary penalty notice (MPN) to appeal to the Information Tribunal. It’s not entirely unusual for such appeals to be settled by consent of the parties (normally when one of them concedes that its case is not tenable). On 6 July 2018 the ICO announced that the Information Commissioner had imposed a fine of £60,000 on STS Commercial Ltd for allowing its lines to be used to send spam texts. STS Commercial Ltd appealed that penalty and upon considering the grounds of appeal, the ICO accepts that the appeal should be allowed and no monetary penalty should be imposed. The ICO apologises to STS Commercial Ltd. Already, most of the traces of the MPN have been removed from the ICO’s website (and Google returns broken links), although the apology itself does not appear to have yet been uploaded. One wonders what on earth occurred that has led not just to the appeal being disposed of, but such contrition from the ICO! It can be unwise to make too much of reported and/or throwaway remarks, but I’m going to look at a recent reported, and possibly throwaway, remark by a senior manager from the Information Commissioner’s Office (ICO) at a recent Law Society conference on the General Data Protection Regulation (GDPR). (despite this, somecommentators have continued to employ such “nonsense”). What Nevinson said though, goes further than anything I’ve seen so far from the ICO. Because, if what he is reported to have said is correct, it would mean that we should see no change in frequency or amount of fines, unless there is a contravention on an unprecedented scale. The highest fine levied under the existing Data Protection Act 1998 (DPA) has been £400,000 (twice – once to Talk Talk and once to Carphone Warehouse) – only 80% of the current maximum. This means that the ICO cannot feel that the current maximum sets a cap which frustrates them by preventing them from issuing higher fines. One would assume, therefore, that the ICO would (must?) see GDPR’s legislative intent as being to “scale up” fines in some way. But no – says Nevinson – £X under DPA will equate to £X under GDPR. Following that line of argument, as we have never seen a fine of £500,000 under DPA we will not see one of that size (or higher) under GDPR, unless a contravention emerges that is worse than anything seen before. I may be wildly over-analysing what he was reported to have said, but I thought it noteworthy enough to blog about it at 06:00 in the morning, so I thought you might too. Oh, and Nevinson might not be right or might not have been accurately reported, and I definitely might not be right. So you’d be silly to pay too much attention, and you certainly shouldn’t forget about the risks that fines may represent under GDPR. Failure to notify the ICO in a timely manner of a personal data breach under PECR carries a £1000 fixed penalty notice – why not something similar under wider data protection law? When the Privacy and Electronic Communications (EC Directive) Regulations 2003 (“PECR”) were amended in 2011 to implement the Citizens’ Rights Directive, an obligation was placed upon providers of a public electronic communications service (“service providers”) to notify personal data breaches to the Information Commissioner’s Office (ICO) “without undue delay”, and in 2013 article 2(2) of European Commission Regulation 611/2013 provided , in terms, that “without undue delay” would mean “no later than 24 hours after the detection of the personal data breach, where feasible”. The 2011 amendment regulations also gave the ICO the power to serve a fixed penalty notice of £1000 on a service provider which failed to comply with notification obligations. As any fule kno, the looming General Data Protection Regulation (“GDPR”) expands to all data controllers this obligation to notify the ICO of qualifying personal data breaches. Under GDPR the definition is broadly similar to that in PECR (“a breach of security leading to the accidental or unlawful destruction, loss, alteration, unauthorised disclosure of, or access to, personal data transmitted, stored or otherwise processed”) and a breach qualifies for the notification requirements in all cases unless it is “unlikely to result in a risk to the rights and freedoms of natural persons”. Under GDPR, the window for notification is 72 hours. But under GDPR, and under the Data Protection Bill currently in Parliament, there is no provision for similar fixed penalty notices for notification failures (although, of course, a failure to notify a breach could constitute a general infringement under article 83, attracting a theoretical non-fixed maximum fine of €10m or 2% of global annual turnover). Is Parliament missing a trick here? If the objective of the PECR fixed penalty notice is to promote compliance with PECR, then why not a similar fixed penalty notice to promote compliance with wider data protection legislation? In 2016/17 the ICO received 1005 notifications by service providers of PECR breaches (up 63% on the previous year) and analysing/investigating these will be no small task. The figure under GDPR will no doubt be much higher, but that is surely not a reason not to provide for a punitive fixed penalty scheme for those who fail to comply with the notification requirements (given what the underlying objective of notification is)? I would be interested to know if anyone is aware of discussions on this, and whether, as it reaches the Commons, there is any prospect of the Data Protection Bill changing to incorporate fixed penalties for notification failures. Wetherspoons delete their entire customer email database. Deliberately. 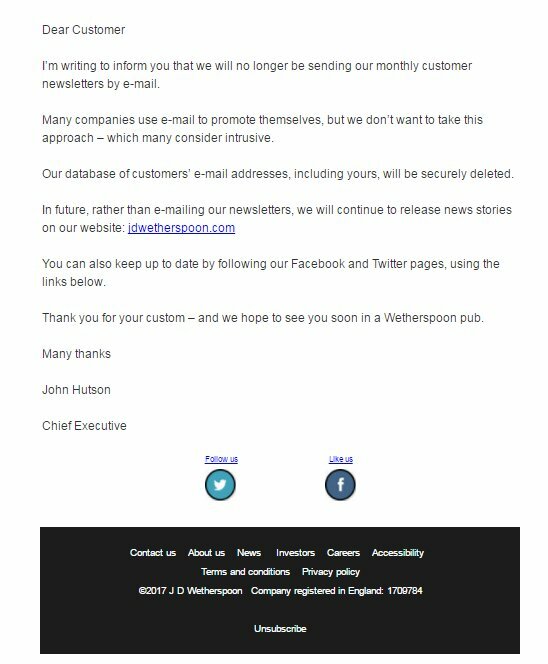 In a very interesting development, the pub chain JD Wetherspoon have announced that they are ceasing sending monthly newsletters by email, and are deleting their database of customer email addresses. Although the only initial evidence of this was the screenshot of the email communication (above), the company have confirmed to me on their Twitter account that the email is genuine. Wetherspoons say the reason for the deletion is that they feel that email marketing of this kind is “too intrusive”, and that, instead of communicating marketing by email, they will “continue to release news stories on [their] website” and customers will be able to keep up to date by following them on Facebook and Twitter. This is interesting for a couple of reasons. Firstly, companies such as Flybe and Honda have recently discovered that an email marketing database can be a liability if it is not clear whether the customers in question have consented to receive marketing emails (which is a requirement under the Privacy and Electronic Communications ((EC Directive) Regulations 2003 (PECR)). In March Flybe received a monetary penalty of £70,000 from the Information Commissioner’s Office (ICO) after sending more than 3.3 million emails with the title ‘Are your details correct?’ to people who had previously told them they didn’t want to receive marketing emails. These, said the ICO, were themselves marketing emails, and the sending of them was a serious contravention of PECR. Honda, less egregiously, sent 289,790 emails when they did not know whether or not the recipients had consented to receive marketing emails. This also, said ICO, was unlawful marketing, as the burden of proof was on Honda to show that they had recipients’ consent to send the emails, and they could not. The result was a £13,000 monetary penalty. There is no reason to think Wetherspoons were concerned about the data quality (in terms of whether people had consented to marketing) of their own email marketing database, but it is clear from the Flybe and Honda cases that a bloated database with email details of people who have not consented to marketing (or where it is unclear whether they have) is potentially a liability under PECR (and related data protection law). It is a liability both because any marketing emails sent are likely to be unlawful (and potentially attract a monetary penalty) but also because, if it cannot be used for marketing, what purpose does it serve? If none, then it constitutes a huge amount of personal data, held for no ostensible purpose, which would be in contravention of the fifth principle in schedule 1 to the Data Protection Act 1998. For this reason, I can understand why some companies might take a commercial and risk-based decision not to retain email databases – if something brings no value, and significant risk, then why keep it? But there is another reason Wetherspoons’ rationale is interesting: they are clearly aiming now to use social media channels to market their products. Normally, one thinks of advertising on social media as not aimed at or delivered to individuals, but as technology has advanced, so has the ability for social media marketing to become increasingly targeted. In May this year it was announced that the ICO were undertaking “a wide assessment of the data-protection risks arising from the use of data analytics”. This was on the back of reports that adverts on Facebook were being targeted by political groups towards people on the basis of data scraped from Facebook and other social media. Although we don’t know what the outcome of this investigation by the ICO will be (and I understand some of the allegations are strongly denied by entities alleged to be involved) what it does show is that stopping your e-marketing on one channel won’t necessarily stop you having privacy and data protection challenges on another. And that’s before we even get on to the small fact that European ePrivacy law is in the process of being rewritten. Watch that space. The trouble with asking for a second opinion is it might be worse than the first one. Reactiv Media get an increased penalty after appealing to the tribunal. In 2013 the First-tier Tribunal (Information Rights) (“FTT”) heard the first appeal against a monetary penalty notice (“MPN”) imposed by the Information Commissioner’s Office (“ICO”). One of the first things in the appeal (brought by the Central London Community Healthcare NHS Trust) to be considered was the extent of the FTT’s jurisdiction when hearing such appeals – was it, as the ICO suggested, limited effectively only to allowing challenges on public law principles? (e.g. that the original decision was irrational, or failed to take relevant factors into account, or took irrelevant factors into account) or was it entitled to approach the hearing de novo, with the power to determine that the ICO’s discretion to serve an MPN had been exercised wrongly, on the facts? The FTT held that the latter approach (similar to the FTT’s jurisdiction in appeals brought under the Freedom of Information Act 2000 (FOIA)) was the correct one, and, notably, it added the observation (at para. 39) that it was open to the FTT also to increase, as well as decrease, the amount of penalty imposed. So, although an appeal to the FTT is generally a low-risk low-cost way of having the ICO’s decision reviewed, it does, in the context of MPNs served either under the Data Protection Act 1998 (DPA) or the Privacy and Electronic Communications (EC Directive) Regulations 2003 (PECR), potentially carry the risk of an increased penalty. And this is precisely what happened when a direct marketing company called Reactiv Media recently appealed an ICO MPN. Reactiv Media bad been held to have made a large number of unsolicited telephone calls to people who had subscribed to the Telephone Preference Service (“TPS”) – the calls were thus in contravention of Reactiv Media’s obligations under regulation 21 of PECR. The ICO determined that this constituted a serious contravention of those obligations, and as some at least of those calls were of a kind likely to cause (or indeed had caused) substantial damage or substantial distress, an MPN of £50,000 was served, under the mechanisms of section 55 of the DPA, as adopted by PECR. Upon appeal to the FTT, Reactiv Media argued that some of the infringing calls had not been made by them, and disputed that any of them had caused substantial damage or distress. However, the FTT, noting the ICO’s submission that not only had the MPN been properly served, but also that it was lenient for a company with a turnover of £5.8m (a figure higher than the one the ICO had initially been given to understand), held that not only was the MPN “fully justified” – the company had “carried on its business in conscious disregard of its obligations” – but also that the amount should be increased by 50%, to £75,ooo. One presumes, also, that the company will not be given a further opportunity (as they were in the first instance) to take advantage of an early payment reduction. One is tempted to assume that Reactiv Media thought that an appeal to the FTT was a cheap way of having a second opinion about the original MPN. I don’t know if this is true, but it if is, it is a lesson to other data controllers and marketers that, after an appeal, they might find themselves worse off. What’s happening with changes to anti-spam laws? The Information Commissioner’s Office (ICO) and DCMS both seemed at the time to be keen to effect the necessary legislative changes to amend the Privacy and Electronic Communications (EC Directive) Regulations 2003 (PECR) so that, per the mechanism at section 55A of the Data Protection Act 1998 (DPA), adopted by PECR by virtue of regulation 31, either a serious contravention alone of PECR, or a serious contravention likely to cause annoyance, inconvenience or anxiety, could give rise to a monetary penalty without the need to show – as now – likely substantial damage or substantial distress. So what has happened? Have representatives of direct marketing companies lobbied against the proposals? It would be interesting to know who was at today’s “roundtable” and what was said. But there was certainly an interesting tweet from journalist Roddy Mansfield. One hopes a report will emerge, and some record of the meeting. One wonders why – if they are – marketing industry bodies might object to the proposed changes. The financial penalty provisions would only come into play if marketers failed to comply with the law. Spammers would get punished – the responsible companies would not. If the Information Commissioner (IC) reasonably requires any information for the purpose of determining whether a data controller has complied or is complying with the data protection principles, section 43 of the Data Protection Act 1998 (DPA) empowers him to serve a notice on the data controller requiring it to furnish him with specified information relating to compliance with the principles. In short, he may serve an “information notice” on the data controller which requires the latter to assist him by providing relevant information. A data controller has a right of appeal, to the First-tier Tribunal (Information Rights) (FTT), under section 48 DPA. These provisions have recently come into play in an appeal by Medway Council of an IC Information Notice. That it did not go well for the former is probably rather understating it. It appears that, back in 2012, Medway had a couple of incidents in which sensitive personal data, in the form of special educational needs documents, was sent in error to the wrong addresses. Medway clearly identified these as serious incidents, and reported themselves to the IC’s Office. By way of part-explanation for one of incidents (in which information was sent to an old address of one of the intended recipients), they pointed to “a flaw in the computer software used”. Because of this explanation (which was “maintained in detail both in writing and orally”) the ICO formed a preliminary view that there had been a serious contravention of the seventh data protection principle (which is, let us remind ourselves “Appropriate technical and organisational measures shall be taken against unauthorised or unlawful processing of personal data and against accidental loss or destruction of, or damage to, personal data”). Moreover, the ICO served a Notice of Intent to serve a Monetary Penalty Notice (MPN). Upon receipt of this, it appears that Medway changed their explanation and said that the incident in question was a result of human error and that there was “no evidence of a ‘system glitch’”. It appears, however, that the ICO was concerned about discrepancies, and insufficient explanation of the change of position, and served a section 43 information notice requiring Medway to “provide a full explanation of how the security breach on 10 December 2012 occurred”. This was the notice appealed to the FTT. d) why the Commissioner and the Tribunal have been provided with so many inaccurate and inconsistent accounts. The words in italics are from section 47(2)(b) DPA, and relate to the potential criminal offence of recklessly making a material false statement in purported compliance with an information notice. Finally, Medway’s conduct of the appeal itself came in for criticism: inappropriate, inconsistent and insufficient redactions were made in some materials submitted, and some evidence was sent in with no explanation of source, date or significance. It is rare that information notices are required – most data controllers will comply willingly with an ICO investigation. It is even more rare that one is appealed, and maybe Medway’s recent experience shows why it’s not necessarily a good idea to do so. Medway may rather regret their public-spirited willingness to own up to the ICO in the first place. GP practices face compulsory audits from this month by the information commissioner to check their compliance with data protection laws, and could be fined heavily if they are found to have breached rules. While it’s good that it is on the ball regarding the legal change to the Information Commissioner’s Office (ICO) audit powers, it is, in one important sense, wrong: I can reassure GP practices that they are not risking “fines” (more correctly, monetary penalty notices, or MPNs) if breaches of the law are found during an ICO audit. In fact, the law specifically bars the ICO from serving an MPN on the basis of anything discovered in the process of an audit. This policy reason behind this provision is clearly to encourage audited data controllers to be open and transparent with the ICO, and not be punished for such openness. GP practices will not receive an MPN for any contraventions of the DPA discovered during or as a result of a section 41A audit. I once heard a rumour that the famous lost HMRC disks of 2007 were not in fact lost after all: the person tasked with posting the disks had, so the rumour went, forgotten to do so, and when the intended recipient, the National Audit Office, had complained, had used the time-honoured excuse “they must be lost in the post”, thinking that this was better than owning up, and that no one would be particularly bothered. I have no idea whether this is true (quite possibly not – the subsequent Poynter report was comprehensive and might have been expected to flush something like that out) but what I think is interesting is that, even if it were, it would not have excused HMRC. The Data Protection Act 1998 (DPA) – which largely languished unloved at the time – requires (by virtue of the seventh principle in Schedule One) a data controller not to prevent specific instances of data loss, but, rather, to take appropriate organisational and technical measures to safeguard against such loss – a contravention of the Act lies in the failure to have these measures in place, not (necessarily) in the failure to prevent a specific incident. The fact that HMRC operated procedures which allowed the sending of huge and excessive amounts of sensitive personal data by post, without encryption measures being used, meant that HMRC were manifestly in contravention of the DPA. The Government has been hit by a new data security scandal after a secret file on the fatal shooting of Mark Duggan by police went missing. A computer disk containing details of the case which triggered Britain’s worst riots in a generation is thought to have been lost in the post by the Ministry of Justice. portable and mobile devices including magnetic media, used to store and transmit personal information, the loss of which could cause damage or distress to individuals, should be protected using approved encryption software which is designed to guard against the compromise of information. where such losses occur and where encryption software has not been used to protect the data, regulatory action may be pursued. The data protection regulatory landscape was very different in 2007, and the ICO did not then have powers to serve monetary penalty notices. A serious contravention of the DPA of a kind likely to cause substantial damage or substantial distress can now result in a “fine” of up to £500,000. The ICO is, we are told, “examining the case”. He will, no doubt, be wanting to know not only about encryption measures, but, more simply, what procedures were in place which allowed such sensitive data to be sent by post. He will also, again no doubt, bear in mind that in recent years he has already served on the MoJ, in the last eighteen months, two monetary penalties totalling £320,000 for not dissimilar failures to have appropriate safeguards in place to protect sensitive personal data.